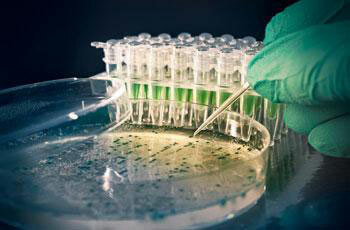 Synthetic biology - A major step towards artificial life Re-engineering biology to make food, fuel, medicine. Stronger, smarter humans. Maybe even bring back the dead. The extinct! Scientists could inserted mitochondrial DNA into the egg cells of women who have had trouble conceiving and the same procedure is successfully performed used in about thirty women, producing babies with genes from the child’s two biological parents and the mitochondrial DNA donor. The babies in fact would have three biological parents. This represent the first step on the path to manipulating human DNA to produce babies with “desirable” traits. (Michael Hanlon, “World’s first GM babies born,” Daily Mail, April 25. The discovery of DNA molecule lead to advances in deciphering of the genetic code, mapping of the human genome and the development of recombinant DNA technology. Synthetic Biology is another transformative innovation that will make it possible to build living machines from off-the-shelf chemical ingredients, employing many of the same strategies evolved by nature over billions of years. This is a multidisciplinary effort from biologists, engineers, software developers, and others to collaborate in finding ways to understand how genetic parts work together, and then to combine them to produce useful applications. Even though the discipline is in its infancy, there are already some promising approaches emerging from labs around the world. Designer plants, animals and humans? Synthetic biology is all about designing and building novel biological functions, systems and organisms for greater efficiency with construction of functional “genetic circuits” and metabolic pathways through DNA-level manipulation. The focus is on the design and construction of core components such as parts of enzymes, genetic circuits and metabolic pathways.. They can be modeled, understood, and engineered to meet specific performance criteria, and the assembly of these smaller parts and devices into larger integrated systems to solve specific problems. Synthetic biologists will soon design and build engineered biological systems just as engineers now design integrated circuits and processors. Thus, the objective of synthetic biology is to transform biology in the same way that synthesis transformed chemistry and integrated circuit design transformed computing. Design in synthetic biology involves a set of extremely powerful techniques for the automated synthesis of DNA molecules and their assembly into genes and microbial genomes. Advances in genetic modification of seeds could increase yields by making crops more drought- and pest-resistant, raise productivity in places where food is in short supply and conserve water,. Genomics can also provide information that can be used to optimize crops for specific soils and climates and guide precision farming practices such as "fertigation" ; a process in which the exactly necessary amounts of water and fertilizer are delivered to crops. Turning biologists into programmers You can engineer DNA to reprogram the metabolism of simple organisms and you can program them to make what you want, or to make it more efficiently. Next - generation genomics has the potential to save lives, feed people, and provide fuels that will be less harmful to the environment. 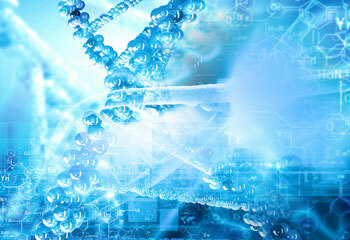 Recent advances however, have enabled researchers to make new sequences of DNA from the scratch. By combining these advances with principles of modern engineering, researchers can now use super computers and lab chemicals to design organisms that do new things such as producing bio-fuels. Thus, from investigating the behaviors of cancerous cells to minimizing the carbon footprint synthetic biology has the potential to provide more effective therapies, cheaper medicines, easily recyclable new materials, bio-fuels and bacteria which can degrade toxic substances from the environment. Genetic engineering enabled the scientists and researchers to alter the genetic code of plants and animals, for attaining desirable features. They take genetic information associated with useful features from one organism, and add it into another one to develop new and desirable variety of plants and animals. Engineering the DNA molecule Combining science and engineering principles in order to design and build novel biological functions and systems. Synthetic biology practitioners construct new biological organisms or biological building blocks by reading, writing and rearranging the genetic code through application of computer-assisted biological engineering principles. They build new life forms from scratch using published gene sequence information or buying inexpensive, made-to-order DNA strands from so-called DNA foundries. Synthetic biology is also referred as “extreme genetic engineering” — re-engineering and designing genes and creating entire genomes that do not exist in nature as well as designing and building molecules, cell compounds and organelles to desired specifications. Synthetic biologists have already synthesized working viruses, including the deadly influenza virus and the poliovirus. In May 2010, the Craig Venter Institute announced that its lab had build the first synthetic, self-replicating bacterial cell. Researchers inserted an entirely synthetic genome into as existing working cell; it accepted the synthetic genome and reproduced. Synthia - First self-replicating synthetic bacterial cell Using the tools of synthetic biology, scientists from the J. Craig Venter Institute installed a completely artificial genome inside a host cell without DNA. In 2010, the Craig Venter Institute synthesized a bacterial genome to create the first living cell controlled by artificial DNA, named "Synthia". "This extraordinary accomplishment is a technological marvel that was only made possible because of the unique and accomplished team", said J. Craig Venter. The team replaced the natural genome of Mycoplasma laboratorium, a bacterium that can produce pneumonia in goats, by a nearly identical genome but synthesized in the laboratory. This genome is a single chromosome of about 1.155 million base pairs, which had previously been decrypted and the information stored in databases. After removing the restriction enzymes (proteins that cut DNA) in a natural bacterium Mycoplasma laboratorium, the scientists transferred the artificial chromosome into it. It took many attempts to make the synthetic DNA replicate. The natural DNA disappears - probably destroyed by the restriction enzymes of the synthetic DNA and the modified cells called "Synthia", have replicated and expanded. 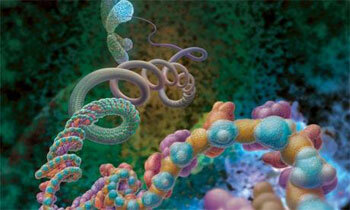 They were also able to transcribe their genes into RNA and translate them into proteins. Their structure and behavior are identical to those of natural bacteria. This is not a synthetic bacterium but only a bacterium controlled by a synthetic genome gathered from fragments of synthesized DNA. The cytoplasm (It is a thick solution that fills each cell and is enclosed by the cell membrane.) is part of the original host cell. This is identical to installing a new operating system in a computer. DIY (Do It Yourself Chromosomes) The synthetic genome when incorporated into the live cell starts adjusting and replicates by its own, hence the name. An international team of scientists built a modified yeast chromosome which is fully functional; designed on a computer and made from scratch in a laboratory. After the achievement of “Synthia”, a year later, Jef Boeke’s team at Johns Hopkins University in Baltimore, US, produced the first completely synthetic chromosome for brewer’s yeast (Saccharomyces cerevisiae). While other teams have synthesized bacterium and viral DNA, Boeke's is the first person to report regarding synthetic chromosome in a eukaryote, an organism whose cells contain a nucleus, like human cells. 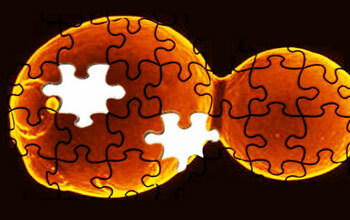 The work is part of a worldwide effort to recreate the 16 chromosomes required for a fully synthetic yeast genome - a feat the researchers hope will be achieved by 2018 or 2019. The synthetic chromosome functions with the same 'yeastiness' as the natural form. 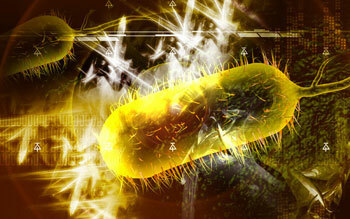 Synthetic biology is emerging from the field of bacterial realm to that of creatures like man. It is the first time a chromosome has been developed for a “eukaryote”, or a cell containing a membrane-bound nucleus and other organelles. This is the latest step in the quest to make the world's first synthetic yeast genome, an advance that would lead to new strains of the organism to help produce industrial chemicals, medicines and bio-fuels. Scientists create first synthetic chromosome for yeast Scientists have made a breakthrough in the field of synthetic biology by creating an artificial chromosome for complex cell organisms (eukaryotes) first time ever. The fungi and people are closely related biologically as both are eukaryotes and their cells have nuclei with several linear chromosomes in them along with lots of other complex and well defined structures called organelles. The yeast being an eukaryote, is genetically much more complex, with an 11 million base-pair genome, compared to the 583,000 base-pairs of Craig Venter's synthetic bacterial genome. Bacteria are prokaryotes whose cells do not have either nuclei or organelles and have their DNA arranged in small, circular chromosomes within their cells. For the past seven years, scientists and a host of undergraduate students painstakingly stitched together short strands of DNA to complete the chromosome. This achievement involved the use of computer-aided design to construct the synthetic version. The project is part of a global initiative called Sc2.0 that aims to eventually fabricate all of the yeast’s chromosomes. The synthetic version, which the scientists call synIII is actually a slimmed-down version of the yeast's naturally occurring chromosome III, which has 316,667 base pairs. The team picked this chromosome because it is the smallest and controls how yeast cells mate and undergo genetic change and responsible for reproduction. 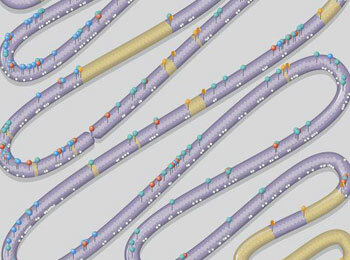 The team have shown that yeast cells carrying this synthetic chromosome are remarkably normal. They behave almost identically to wild yeast cells, only they now possess new capabilities and can do things that wild yeast cannot. For example, such methods could be used to improve yeast's ability to thrive in harsh environmental conditions, such as very high concentrations of alcohol. The team did extensive tinkering with their chromosome, instead of just copying the nature. They removed unwanted genes here and there like removing genetic parasites called trasposons, which use a cell’s DNA replication machinery without contributing anything to organism’s well being. They have also cleaned up areas near the chromosome ends , where the genetic letters appear for no apparent reason and removed regions called introns that break up the functional parts of genes.. 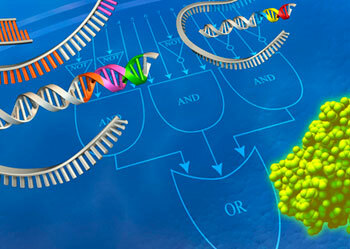 Some genes related to transfer RNA are also removed. The whole design is carried out on a computer and made provision in the design to carry out subsequent modifications in vivo by adding about 98 pieces of DNA called loxPsym sequences which mark individual genes and allow those genes to be excised by application of an appropriate enzyme. This information is useful to find out which genes are necessary for survival by knocking out some of those genes. They have also replaced some of the stop codons and modified the chromosome so as to make proteins that contain unnatural amino acids so that the new proteins have entirely new properties. Computer designed 'YEAST' Scientists have replaced all of the DNA in the arm of a yeast chromosome with computer-designed, synthetically produced DNA that is structurally distinct from its original DNA. Codons are three letter DNA words representing specific amino acids and their location in a protein but stop codons (TGA or TAA) communicate to reading enzymes that they have reached the end of the message. Design of synthetic chromosome used TAA and left TGA free, to be used after certain modification to be used as 21st amino acid, in addition to the 20 natural ones. It then successfully incorporated the designer chromosome into live yeast cells, endowing them with new capabilities not found in naturally occurring yeast. Till date, it is the most extensively altered chromosome ever built. The changes have not destabilized the new chromosome and the team could try the same in 125 generations in 30 different sets of yeast proving the robustness. 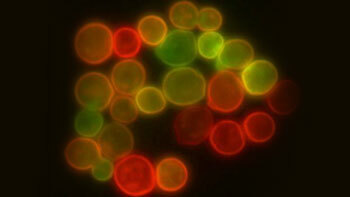 The goal is to create a completely synthetic genome of yeast. These two achievements established the possibility that genomes can be designed in the computer, chemically made in the laboratory and transplanted into a recipient cell to produce a new self-replicating cell controlled only by the synthetic genome. Of course, there is concern over these man-made organisms taking a field trip to the outside world. Since designer organisms could potentially pass their genetic material down to future generations, there is a real risk of replication getting out of hand. However, scientists assure the public that these organisms can be engineered to self-terminate under specific conditions. In the meantime, you can bet that there will be multitude of beneficial products which will be the outcomes of synthetic biology in coming future. 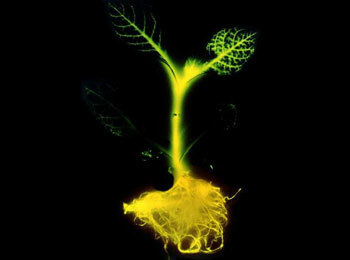 Glowing Plants: Natural Lighting with no Electricity Glowing Plants‘ is a kickstarter project which is set to create the first publicly available bioluminescent plants. To do this, they will be adding the luciferase-luciferin gene system into the model organism Arabidopsis thaliana. Though synthetic biology is the budding science and was born just over a decade ago, it is bringing together engineers and biologists to design and build novel bio-molecular components, networks pathways, and use these constructs to rewire and reprogram organisms. These re-engineered organisms will definitely have impact on our lives in the coming years, leading to cheaper drugs, means to fuel our cars, and targeted therapies to attack deadly viruses and diseases such as cancer. Although research is still ongoing to identify new biological parts and to understand the design principles behind them, existing tools and de novo engineering principles are already being used to address a variety of health and environmental problems. 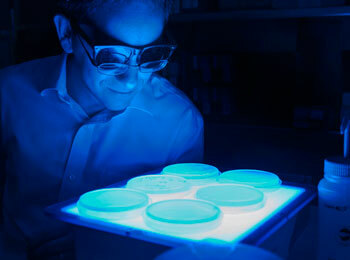 Researchers are trying to implement their ideas like programming bacteria to carry out specific functions such as fluorescing when parasites are detected in drinking water, gobbling up oil spills and pollution, churning out anti-malaria vaccines. 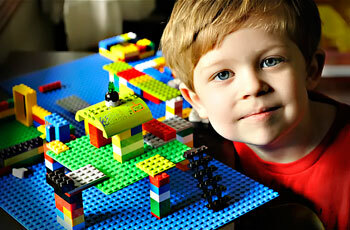 Synthetic biology is bringing us ever closer to making such visions a reality. Plug And Play Synthetic Biology – Rewriting An Entire Genome A team of scientists from Harvard and Yale have recorded the entire genome of the bacteria E. coli, and in a dramatic demonstration of the potential of rewriting an organism’s genetic code, they have improved the bacterium’s ability to resist viruses. Several drugs which are currently being used are extracted from plants or act according to therapeutic principles of medicinal plants. They could be manufactured by synthesis or improved to reduce side effects. This may involve modifying the plant genome to improve therapeutic properties and integrating it into a process of chemical synthesis. There is a possibility to repair damaged tissues of human beings and burn victims can receive skin transplants produced by techniques of artificial growth. Synthetic biology could also enable the development of personalized therapies: drugs could be tailor made depending on the patient's genome or adjusted to the patient's organism. Thus the goal of this new science involves designing and creating forms of life that have never existed in nature and offer incredible benefits to the welfare of mankind.. The researchers believe this extraordinary technology has huge potential in producing new fuels, materials and medicines and many more in the coming future. We should be able to get designer plants, animals and even humans. We may perhaps be able to create a baby with desirable traits.